We typically find what we’re looking for in the last place we look. Of course, that’s because most people won’t continue to look once they’ve found “it”. Have you tried medication, surgery, and the medical approach? Perhaps you view chiropractic as a sort of last resort. No matter what, if you’re still looking it probably means you haven’t found what you need. When all else has failed, chiropractic brings hope. We want our patients to leave with trust, knowing that we have their best interests in mind. We’re not here simply to earn a paycheck – because we’ve been in your shoes ourselves, it’s important to us that we meet your healthcare needs and that you know you can depend on us. One of the many things we do to achieve that trust is keeping the office running on time. We know how important your time is, and we value it. If you arrive on time, you’ll find that getting in and out on time is the rule and not the exception at Henry Chiropractic. Through our focus on building trusting relationships, we’ve built a referral-based practice that runs generations deep. 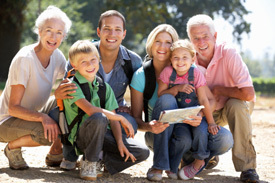 Some of the families we see include grandparents, adult children, and grandchildren. “Our favorite patients to work with are those who are motivated to make a change,” says Dr. Henry. Our patients have proven that an optimistic outlook and dedicated care can overcome even the most difficult circumstances. Stop by or give us a call at (410) 285-2600 to learn more about how chiropractic can help you.